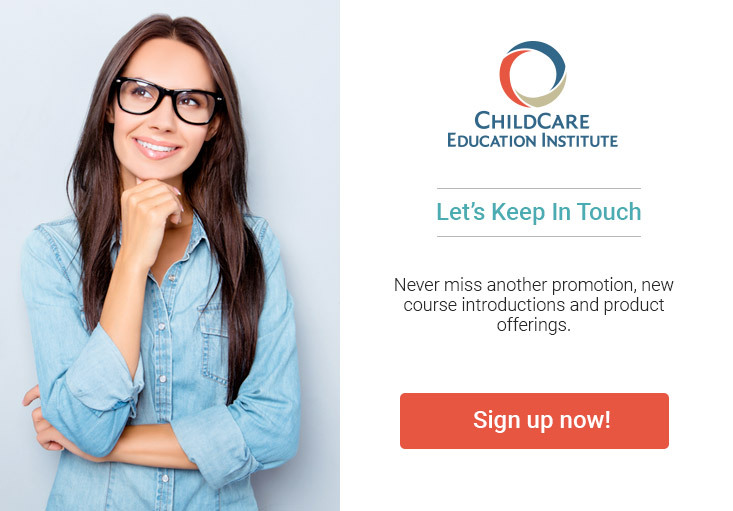 This policy applies to all information collected or submitted on websites operated by ChildCare Education Institute, as listed above. In some instances, you can order products, make requests, register to receive materials or take courses. In other instances, you can submit information about other people. For example, if you have a friend or family member to whom you would like ChildCare Education Institute to send information, you can submit the recipient’s contact information. You may choose not to provide specific types of information, but choosing to do so might prevent you from accessing some of our features. Personal student information provided to CCEI and in conjunction with use of CCEI services is used solely for the purpose of administering Services as outlined under this Acknowledgment and in connection with reporting to state and federal agencies or workforce registries. We use information that you might provide about others only to send information and to confirm delivery. We do not share this information with parties other than our strategic partners, except to the extent necessary to complete the order process. In cases in which information is shared with our strategic partners, our partnership agreement explicitly prohibits the exchange or sale of your information with parties outside of the partnership. Additionally, any material or information sent to you will pertain to an area of related interest. You can register with our Web site if you would like to receive our course catalog and updates on our new classes and services. Information you submit on our Web site will not be used for this purpose unless you fill out the registration form. We also use non-identifying and aggregate information to share with advertisers. For example, we might tell an advertiser that a certain number of individuals visited a certain area on our Web site, or that a certain number of men and a certain number of women filled out our registration form, but we would not disclose any information that could be used to identify those individuals. We may also use information to deliver to you information about our company and promotional material from some of our partners, trend analysis, pattern detection, and site administration. Your information may also be used to contact you when necessary and may be shared with other companies that may want to contact you with offers consistent with your stated preferences. Users may opt-out of receiving future mailings from us and other entities by following the instructions set forth in the opt-out section below. We never use or share the personally identifiable information provided to us online in ways unrelated to the ones described above without also providing you with an opportunity to refuse or otherwise prohibit such unrelated uses. To prevent unauthorized access, maintain data accuracy, and ensure the correct use of information, we use appropriate industry standard security measures, including physical, electronic, and managerial procedures, to safeguard and secure the information we collect online. While there is no such thing as “perfect security” on the Internet, we will take all reasonable steps to ensure the safety of your personal information. A “cookie” is information that is stored on your computer that helps us to identify you as a previously registered user or visitor of our site, which helps to personalize your experience or provide features. Cookies do not spy on you or otherwise invade your privacy, and they cannot invade your hard drive and steal information. Rather, they help you navigate a Web site as easily as possible. If you prefer not to receive cookies and to remove the feature that allows you to receive them, you can use the Help feature of your Browser to modify your preferences. However, deleting and prohibiting cookies may prevent the Web site from operating correctly and may affect your experience on the Web site. We use your IP Address to help diagnose problems with our server, and to administer our Web site. Our Web site contains links to other Web sites. ChildCare Education Institute is not responsible for the privacy practices or the content of such Web sites. You can access all personally identifiable information that we collect online and maintain by email at questions@cceionline.edu or by phone during normal business hours at 1.800.499.9907. We use this procedure to safeguard your information. To the extent that the information you provide us is also stored in other databases, we cannot always ensure that such corrections or deletions will reach the other databases. We will use all reasonable efforts to ensure that your information is removed from or corrected in our records. You can correct factual errors in your personally identifiable information by sending us a request that credibly shows error. To protect your privacy and security, we will also take reasonable steps to verify your identity before granting access or making corrections. You may opt-out of receiving communications from our partners, and from us, by the either sending us an e-mail to questions@cceionline.edu or calling us during normal business hours at 1.800.499.9907. This site makes chat rooms, forums, message boards, and/or news groups available to its users. Please remember that any information that is disclosed in these areas becomes public information. ChildCare Education Institute is not responsible for the privacy of such information disclosed in those locations, so you should exercise caution when deciding to disclose your personal information in those locations.